Dunster has a loyal following. There have been in the past and no doubt will be in the future other commemorations of Dunster's birth and death. 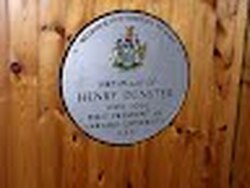 In 1989, for example, a plaque was unveiled at the Bolholt Hotel in Bury to mark Dunster's birthplace. The event was attended by Mrs. Margaret Rickaby, a direct descendant of Dunster and shown in the picture, below, in the company of persons representing the local council and its planning committee. There were also plans in late 2009 to name streets in a new industrial park in Bury in honor of Henry Dunster and Harvard University, to mark the quatercentenary of Dunster's birth. There are, in addition, strong links between Magdalene College, Cambridge, and Dunster, based on Dunster's membership of the College after he went up to Cambridge from Bury Grammar School (see the Magdalene link to the left). These links are the subject of an essay: Ronald Hyam, Magdalene and America's First University: The Quatercentenary of Henry Dunster, 42-49, MAGDALENE COLLEGE MAGAZINE (New Series), No. 53, (2008-09). See also the site of the Henry Dunster Association, linked on the left.